In the summer of 1956 James Clay was a 20-year-old tenor saxophonist from Dallas, who had been living and playing in Los Angeles since mid-1955. At that time his colleagues were all young and independent experimentalists, completely outside of the flourishing West Coast jazz movement – players like trumpeter Don Cherry, bassist Billy Higgins, and altoist Ornette Coleman – and though he said he was not an outside player, he worked easily within the unconventional settings of Coleman’s compositions. Paradoxically, however, his only recordings were straight ahead, not at all in line with Ornette’s controversial music. On them his ideas flow melodically, especially in ballads and mid-tempos. On faster tunes, his blowing statements come from the strong swinging style and hot tone that characterized other Texas tenors such as Illinois Jacquet and Arnett Cobb, with a hard-bop approach clearly influenced by his idol Sonny Rollins. 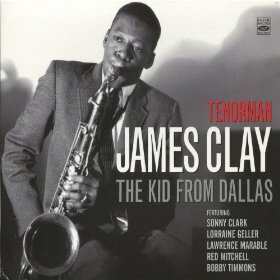 This CD contains all James Clay studio performances on tenor sax while the young kid from Dallas was living in Los Angeles in the mid Fifties. Track #1: James Clay (ts), Bobby Timmons (p), Jimmy Bond (b) and Peter Littman (d). Tracks #2-9: James Clay (ts & fl), Sonny Clark (p), Jimmy Bond (b) and Lawrence Marable (d). Track #10: James Clay (ts), Lorraine Geller (p), Red Mitchell (b) and Frank Capp (d). Tracks #11-14: Same quartet, except Billy Higgins, replaces Capp on drums.